A stunning combination of copper and handmade Petersen bricks is creating a lot of interest for a new family home in Elwood, Melbourne. Architect Anthony Dann of Pleysier Perkins worked with the owner Ben Young to design and build a contemporary new home. The owner had a passion for trades, a strong work ethic, absolute attention to detail and faultless project management skills, which made it easier for Anthony to conceptualise and execute the design. The new residential dwelling, Austin House, comprised of three storeys, four bedrooms and a subterranean level on an extremely compact construction site. Ben collaborated closely with the architects to project manage the entire build. According to Anthony, Ben was able to organise and manage the quality of every trade working on the site. His attention to detail combined with some clever design work, and faultless material choice, led to a timeless design that he and his family will enjoy for years to come. Ben was also responsible for what would become one of the most striking features of the build – the bricks on the exterior of the house. Ben chose Petersen’s D48 bricks in a Flensborg Format (228 x 108 x 40mm) for their handmade, rustic appearance. Anthony concurred with the choice, especially the colour and shape variation offered in Petersen bricks, and particularly the fact that they were handmade. To Anthony, the subtle little shifts and changes in each brick, lent an artwork finish to the wall. 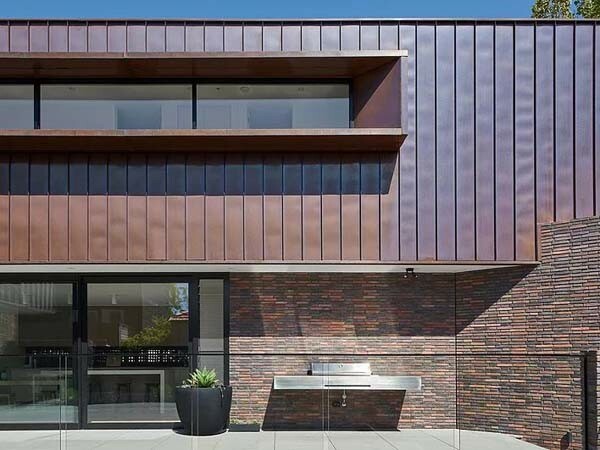 However, what’s truly turning heads in Elwood is the way copper has been combined with Petersen D48 bricks on the facade to create a striking palette with a timeless effect. For more information on Petersen D48 Flensborg Format bricks please contact Robertson's Building Products Pty Ltd.